In recent years, it has become commonplace among American educators to argue that if schools aim to prepare young people for life in today’s complex and diverse world, then they must provide instruction in more than just academic content and skills (in English language arts, mathematics, science, social studies, and other subject areas). Social and emotional learning (SEL), too, is critical to students’ long-term success in and out of school, and it merits careful, sustained attention throughout K-12 education (Bridgeland et al., 2013; DePaoli et al., 2017; Weissberg et al., 2015). Already, thousands of schools within and outside the United States have implemented SEL programs (Humphrey, 2013; Weissberg & Cascarino, 2013), and many U.S. state departments of education have issued, or are in the process of issuing, standards for the development of specific SEL skills at each grade level (Dusenbury et al., 2015). So, too, have many federal, state, and local policy makers become willing to provide funding support for SEL programs. Although SEL has been conceptualized in various ways, it can broadly be understood as the processes through which children and adults acquire and effectively apply the knowledge, attitudes, and skills necessary to manage their emotions, set and achieve positive goals, feel and show empathy for others, establish and maintain positive relationships, and make responsible decisions (Weissberg & Cascarino, 2013). More specifically, Roger Weissberg and colleagues (2015) have identified a set of five core clusters of social and emotional competencies: self-awareness, self-management, social awareness, relationship skills, and responsible decision making. These competencies are thought to facilitate students’ academic performance, positive social behaviors, and social relationships during the school years; reduce behavior problems and psychological distress, and help to prepare young people to succeed in college, work, family, and society (Elias, 2014; Jones & Kahn, 2017). 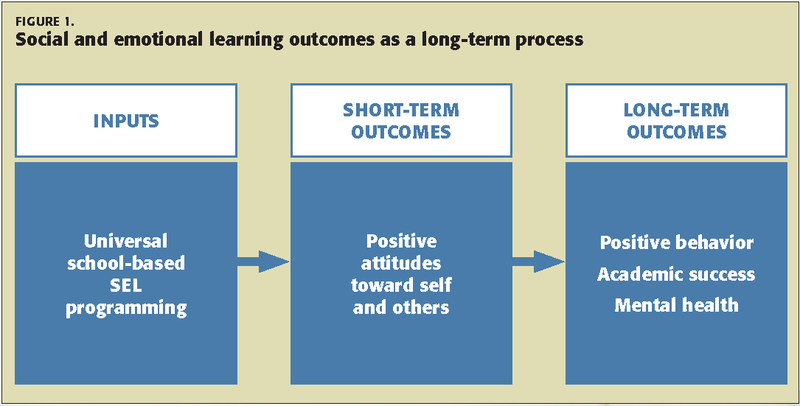 As illustrated in Figure 1, scholars and advocates believe that SEL programming is likely to have both immediate and longer-term benefits for young people, both in school and later life. However, educators and policy makers may wonder whether researchers have documented the effectiveness of SEL programs in bringing about these positive outcomes. To answer this question, we’ve examined four large-scale meta-analyses on student outcomes related to participating in school-based SEL programs. (A meta-analysis is a statistical method of synthesizing many previous efforts to measure the effectiveness of a given program; it’s a way of pooling together all of the available research findings and boiling them down to a single, overall assessment.) The sum total of the existing evidence, we found, strongly suggests that SEL programs do, in fact, have significant benefits for participating students. Compared to control students, students participating in SEL programs showed significantly more positive outcomes with respect to enhanced SEL skills, attitudes, positive social behavior, and academic performance, and significantly lower levels of conduct problems and emotional distress. The higher academic performance of SEL program participants translated into an 11 percentile-point gain in achievement, suggesting that SEL programs tend to bolster, rather than detract from, students’ academic success. This review also indicated that SEL programs managed by teachers and other school staff consistently yielded positive results, and it highlighted the role of careful program implementation in ensuring positive student outcomes. It also identified several priorities for further research, including studies of longer-term effects of participating in SEL programs and research into the effectiveness of programs outside the United States. Finally, because the review was limited to research findings available through the end of 2007, the authors also called for follow-up analyses of newer data. Since the publication of that first study, three additional meta-analyses have been conducted (Sklad et al., 2012; Taylor et al., 2017; Wiglesworth et al., 2016). All three echoed the earlier one’s major findings: When researchers synthesized results from hundreds of existing studies in this area, they found that students who participated in SEL programs saw greater gains in SEL competencies and academic performance relative to students who did not participate. Further, not only did these three meta-analyses touch on newer research findings, but they also included more international comparisons and more information on both the immediate and longer-term benefits of SEL programs. In short, they provide a useful complement to and extension of the earlier work. The fact that independent research teams from the United States and Europe have replicated positive outcome findings from many experimental-control group evaluations involving several hundred thousand K-12 students offers strong support that well-implemented SEL programs are beneficial for children and adolescents. SEL skills, such as identifying emotions, goal setting, self-management, problem solving, conflict resolution, refusal skills, and decision making. efficacy), school bonding, drug use and violence, and helping others. Positive social behaviors, such as getting along with others, helping others, showing concern for others, empathy, prosocial problem solving, peace building, and cooperation. Conduct problems, including disruptive classroom behavior, fighting, hurting others, verbal aggression, bullying, discipline referrals, and delinquent acts. Emotional distress, such as depression, anxiety, stress, and social withdrawal. Academic performance, including reading and math achievement, standardized test scores, school grades, and academic competence from teacher ratings. Tables 2 and 3 summarize the findings focusing on short-term outcomes (referred to as “post,” for data collected immediately post-intervention) and longer-term outcomes (referred to as “follow-up,” for data collected later on). Where mean effect sizes are positive, this reflects the superior performance of students participating in SEL programs relative to similar students who did not (referred to as “controls”). 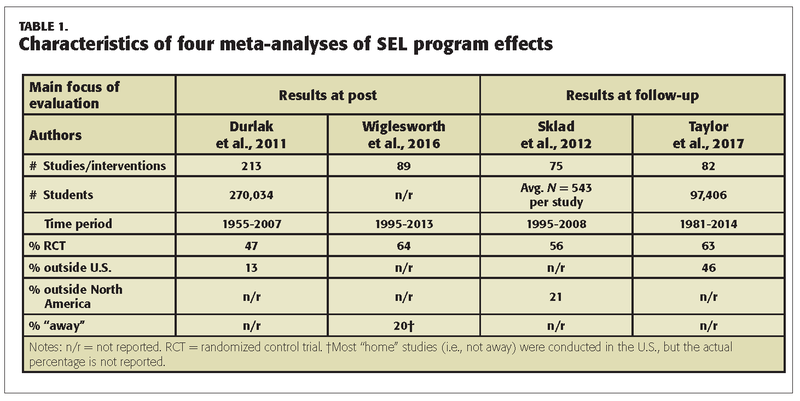 As shown in Table 2, the two analyses focusing on the immediate effects of SEL programs (Durlak et al., 2011; Wiglesworth et al., 2016) found statistically significant benefits for participating students. When student outcomes were measured later on (Sklad et al., 2012; Taylor et al., 2017), the effects were not as strong overall, meaning that they tended to fade to some extent over time — this isn’t surprising, though; studies of all types of educational interventions tend to find that short-term effects are stronger than longer-term effects. Leading researchers and educators recommend that SEL programming will be most beneficial when it is implemented in planned, ongoing, systemic ways from preschool through high school (Berman et al., 2018; Collaborative for Academic, Social, and Emotional Learning, 2017; Jones & Kahn, 2017; Weissberg et al., 2015). point gain in achievement, over the long term, for students who participated in SEL programs relative to those who did not. To put it another way, SEL programs appear to have as great a long-term impact on academic growth as has been found for programs designed specifically to support academic learning (Hill et al., 2008). Second, the study by Taylor and colleagues (2017) found that the best predictor of the strength of students’ long-term gains was the strength of their short-term SEL gains. That is, where students saw large immediate gains in their social and emotional skills, the learning tended to be relatively sticky, fading to a lesser degree over time. Altogether, the meta-analyses we studied contain outcome data from 356 research reports summarizing short- and long-term effects for hundreds of thousands of K-12 students in a range of SEL programs within and outside the United States. With these findings, three different research groups — based not just in the United States (Durlak et al., 2011; Taylor et al., 2017) but also the United Kingdom (Wiglesworth et al., 2016) and The Netherlands (Sklad et al., 2012) — have independently reached the same general conclusion about universal school-based SEL programs: They produce positive benefits for participating students on a range of behavioral, attitudinal, emotional, and academic outcomes that are evident both immediately after the intervention and during various follow-up periods, depending on the specific outcome in question. In a recent national survey, school administrators called for additional data on the link between SEL and student academic performance (DePaoli et al., 2017). 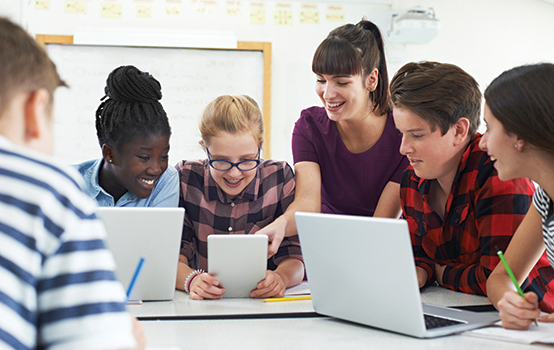 We can report that all four of these meta-analyses showed significant, positive connections between participation in universal, school-based SEL programs and student academic performance over the short and longer term. Given the consistent and enduring nature of this association, we believe that the expansion of SEL programming in low-performing schools is warranted (AEI/Brookings Working Group on Poverty and Opportunity, 2015) and that teacher preparation programs should include serious attention to SEL (Schonert-Reichl et al., 2017). Critics might point out that the findings included in the 2017 meta-analyses are dated already, since they include only studies that were concluded by 2014. However, a lag time of a few years is typical of meta-analysis, given the amount of time it takes to survey and collect the existing research studies, do the analyses, conduct the peer review process, and go through the usual publication timeline. It is worth noting, though, that individual studies appearing up through at least the fall of 2017 have continued to report positive effects for SEL (e.g., Duncan et al., 2017; Miller et al., 2017; Muratori et al., 2017). Overall, then, current data indicate that SEL programs are both feasible and effective in a variety of educational contexts in many countries around the world. SEL is neither a fad nor a flash in the pan but represents a useful way to improve students’ social and emotional skills, which are associated with several positive behavioral and academic outcomes. The meta-analyses discussed here use statistical methods to study the effectiveness of diverse SEL programs, grouping together approaches that differ from one another in the specific skills they target, the nature of the instruction, the duration, and the kinds of students participating. Thus, it will be important for future research to pursue a couple of narrower questions: What type of program is most effective for promoting which particular SEL skills and attitudes in the short and long term for which students, and what are the specific components of each program that account for its impacts? Further, we also need research into the implementation, wide-scale dissemination, continual monitoring, improvement, and sustainability of SEL programs that have demonstrated their initial value. For example, how can we increase the capacity of schools to conduct SEL programs and assess what they have done? And how can we best align educational policies and funding so that more schools are able to offer SEL programs? In effect, we need to create better synergy among researchers, practitioners, and policy makers. Doing so will require that multiple stakeholders (policy makers, funders, educators, researchers, families, and community members) work together to ensure that as many students as possible benefit from well-conceptualized and well-implemented SEL programs. AEI/Brookings Working Group on Poverty and Opportunity. (2015). Opportunity, responsibility, and security: A consensus plan for reducing poverty and restoring the American dream. Washington DC: American Enterprise Institute for Public Policy and the Brookings Institution. Berman, S., with Chaffee, S., & Sarmiento, J. (2018). The practice base for how we learn: Supporting students’ social, emotional, and academic development — Consensus statements of practice from the Council of Distinguished Educators. Washington, DC: National Commission on Social, Emotional, and Academic Development, The Aspen Institute. Bridgeland, J., Bruce, M., & Hariharan, A. (2013). The missing piece: A national teacher survey on how social and emotional learning can empower children and transform schools. Washington, DC: Civic Enterprises and Hart Research Associates for CASEL. Collaborative for Academic, Social, and Emotional Learning (CASEL). (2017). Key implementation insights from the Collaborating District Initiative. Chicago, IL: Author. DePaoli, J.L., Atwell, M., & Bridgeland, J. (2017). Ready to lead: A national principal survey on how social and emotional learning can prepare children and transform schools. Washington, DC: Civic Enterprises and Hart Research Associates for CASEL. Duncan, R., Washburn, I.J., Lewis, K.M., Bavarian, N., DuBois, D.L., Acock, A.C., . . . & Flay, B.R. (2017). Can universal SEL programs benefit universally? Effects of the Positive Action Program on multiple trajectories of social-emotional and misconduct behaviors. Prevention Science, 18, 214-224. Durlak, J.A., Weissberg, R.P., Dymnicki, A., Taylor, R.D., & Schellinger, K.B. (2011). The impact of enhancing students’ social and emotional learning: A meta-analysis of school-based universal interventions. Child Development, 82, 405-432. Dusenbury, L.A., Zadrazil Newman, J., Weissberg, R.P., Goren, P., Domitrovich, C.E., & Mart, A.K. (2015). The case for preschool through high school state learning standards for SEL. In J.A. Durlak, C.E. Domitrovich, R.P. Weissberg, & T.P. Gullotta (Eds. ), Handbook for social and emotional learning: Research and practice (pp. 532-548). New York, NY: Guilford Press. Elias, M.J. (2014). Social-emotional skills can boost Common Core implementation. Phi Delta Kappan, 96 (3), 58-62. Hill, C.J., Bloom, H.S., Black, A.R., & Lipsey, M.W. (2008). Empirical benchmarks for interpreting effect sizes in research. Child Development Perspectives, 2, 172-177. Humphrey, N. (2013). Social and emotional learning: A critical appraisal. Thousand Oaks, CA: SAGE. Jones, S.M. & Kahn, J. (2017). The evidence base for how we learn: Supporting students’ social, emotional, and academic development – Consensus statements of evidence from the Council of Distinguished Scientists. Washington, DC: National Commission on Social, Emotional, and Academic Development, The Aspen Institute. Miller, C.F., Kochel, K.P., Wheeler, L.A., Updegraff, K A., Fabes, R.A., Martin, C.L., & Hanish, L.D. (2017). The efficacy of a relationship building intervention in 5th grade. Journal of School Psychology, 61, 75-88. Muratori, P., Bertacchi, I., Giuli, C., Nocentini, A., & Lochman, J.E. (2017). Implementing Coping Power adapted as a universal prevention program in Italian primary schools: A randomized control trial. Prevention Science, 18, 754-761. Schonert-Reichl, K.A., Kitil, M.J., & Hanson-Peterson, J. (2017). To reach the students, teach the teachers: A national scan of teacher preparation and social and emotional learning. Vancouver, BC: University of British Columbia. Sklad, M., Diekstra, R., De Ritter, M., Ben, J., & Gravesteijn, C. (2012). Effectiveness of school-based universal social, emotional, and behavioral programs. Do they enhance students’ development in the area of skill, behavior, and adjustment? Psychology and Schools, 49, 892-909. Weissberg, R.P. & Cascarino, J. (2013). Academic learning + social-emotional learning = national priority. Phi Delta Kappan, 95 (2), 8-13. Weissberg, R.P., Durlak, J.A., Domitrovich, C.E., & Gullotta, T.P. (2015). Social and emotional learning: Past, present, and future. In J.A. Durlak, C.E. Domitrovich, R.P. Weissberg, & T.P. Gullotta (Eds. ), Handbook of social and emotional learning: Research and practice (pp. 3-19). New York, NY: Guilford Press. Wiglesworth, M., Lendrum, A., Oldfield, J., Scott, A., ten Bokkel, I., Tate, K., & Emery, C. (2016). The impact of trial stage, developer involvement and international transferability on universal social and emotional learning programme outcomes: A meta-analysis. Cambridge Journal of Education, 46, 347-376. Citation: Mahoney, J.L., Durlak, J.A., & Weissberg, R.P. (2018). An update on social and emotional learning outcome research. Phi Delta Kappan, 100 (4), 18-23. JOSEPH L. MAHONEY (jmahone4@uwsuper.edu) is assistant professor of psychology at the University of Wisconsin-Superior and senior research scientist at the Collaborative for Academic, Social, and Emotional Learning in Chicago, Ill.
JOSEPH A. DURLAK (jdurlak@luc.edu) is an emeritus professor of psychology at Loyola University and senior research scientist at the Collaborative for Academic, Social, and Emotional Learning in Chicago, Ill. He and Roger P. Weissberg are coeditors, with Celene Domitrovich and Thomas Gullotta, of the Handbook of Social and Emotional Learning: Research and Practice (Guilford, 2016). ROGER P. WEISSBERG (rweissberg@casel.org; @RogerWeissberg) is chief knowledge officer at the Collaborative for Academic, Social, and Emotional Learning in Chicago, Ill. He and Joseph A. Durlak are coeditors, with Celene Domitrovich and Thomas Gullotta, of the Handbook of Social and Emotional Learning: Research and Practice (Guilford, 2016). I would be interested in whether the effects are moderated by grade level (i.e., elementary vs. middle school vs. high school) and am somewhat surprised that this analysis has not been conducted. Are there any plans for this? This analysis would establish whether these programs are effective across the entire age range, which is something that is implied but not supported by evidence.